Time for a new batch of weekly favorite food and restaurant articles! This week, I have some exciting things to share! When I came across this blog post and read the ingredients list, I knew it had to be good! How can you go wrong combining lemon curd and blueberry together?? For the gluten free readers out there, this recipe is perfect for you! For all of you Friends fans out there, I'm a little like Joey. I love sandwiches!! This chicken sandwich has a tandoori inspired chicken with some cucumber, tomato, and spinach! Can't wait to try this one out! This fresh chicken tikka sandwich is the answer for your weekend lunch! Oven-baked tandoori chicken served with Greek yogurt and fresh vegetables, you’re sure to love it! Everyone loves a good soup, especially won ton soup! Lately, when we get Chinese food on one of those nights we're all too tired to cook, won ton soup has been the go to for my wife. So, I will have to try this out to make some won ton soup for her at home! It's summer time, and I don't know about you, but I am always looking for some delicious and light recipes to try when it's hot out. Pineapple and lime are the perfect summer flavors! 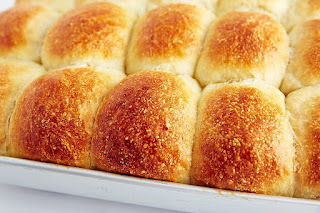 I've long searched for the perfect yeast roll. The frozen dinner roll variety usually does the trick, but sometimes I want something more. Maybe something more like what I find when I go out to restaurants! I may have finally found it with this recipe!